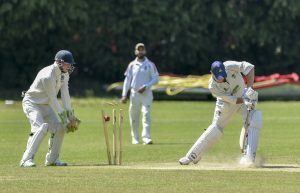 CRICKET: WOKING & HORSELL notched up their first league win of the season beating near neighbours Byfleet by seven wickets. For once, the weather was kind to the teams and conditions at Brewery Road were perfect for a high-scoring match. Woking won the toss and elected to field first.